The William B. Joyner Memorial Fund was established shortly after Bill’s death on 24 March 2001 to honor his distinguished career at the U.S. Geological Survey and his relentless pursuit of bringing earthquake seismology and earthquake engineering closer together, so as to provide for a safer society. Unlike most Earth scientists, Bill understood that this goal would be achieved not through scientific insight alone but through patient, incremental changes in building codes based on new scientific findings as they came along, many of them his. This realization in turn required that new scientific findings be communicated in such a way that a clear and common understanding of new scientific findings is shared by those of many diverse interests who are responsible for building-code changes. The purpose of the William B. Joyner Memorial Fund is to continue and generalize technical communication at the interface of earthquake science and earthquake engineering through the William B. Joyner Memorial Lecture series. The Joyner Lectures will deal with many earthquake hazards, not just that due to earthquake ground motion alone. For example, fault-displacement hazard is of considerable importance to lifeline engineering and thus requires communication of geologic information concerning the size distribution of earthquake faulting displacements and their frequency of occurrence. The Joyner Lectures are also structured on the basis that meaningful communication between science and engineering is a two-way street. Earthquake scientists have much to learn from earthquake engineers, for example, in focusing their research, at least in part, on safety-critical engineering needs. The William B. Joyner Fund was initiated shortly after his death by Mary Lou Joyner, Bill’s wife, with a gift of $10,000. This gift was matched by Bill’s friends and colleagues at the U.S. Geological Survey in May 2001. In support of a desired goal of $100,000 for the Joyner Fund, the Board of Directors of the Seismological Society of America donated $10,000 to the Joyner Fund in September 2002. In November, 2005, the Joyner Fund’s value passed $100,000, the original goal for the Fund. The Joyner Committee agreed in May, 2005, to provide $1,000 each year to the Charles F. Richter Early Career Awardee. When finances permit, it is the intention of the Joyner Committee to increase this award to $1500. The Joyner Committee has also decided to terminate the $2500 award to the Joyner Lecturer in favor of a $5,000 allocation to provide travel funds for the Joyner Lecturer to give the lecture at places of his or her choosing. Unused funds as of April of the following year will be available to support student travel to the SSA meeting in that following year. These expenditures will require a larger Fund principal for them to be sustained by return-on-investment alone. William (“Bill”) B. Joyner died of thyroid cancer on 24 March 2001. Bill was born in 1929, grew up in Nebraska, and received his A.B., A.M., and Ph.D. degrees from Harvard University. He joined the Regional Geophysics Branch of the U.S. Geological Survey as a geophysicist in 1964, working on computer analysis of gravity and magnetic data. From 1967 to 1970 Bill was assigned to the national headquarters of the USGS as the staff geophysicist for the Office of Earthquake Research (1967-1969) and the Office of Geochemistry and Geophysics (1969-1970). While serving in Washington he wrote a substantial part of the “Proposal for a Ten-year National Earthquake Hazards Program”, which was important in initiating the highly regarded USGS program in earthquake hazard reduction. In 1970 he stepped down from administrative duties and became a project scientist in the Western Region Headquarters of the USGS, where he concentrated his research on the prediction of earthquake ground motion for engineering design. 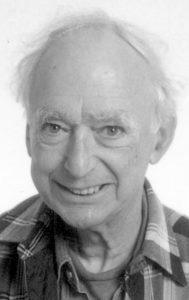 He made many fundamental contributions to that field, including developing numerical methods for calculating nonlinear soil response in one and two dimensions, deriving what became the industry-standard equations for predicting strong ground motion from earthquakes, and, most recently, describing the essential features of surface-wave generation and propagation in deep sedimentary basins. From 1999 until shortly before his death, he directed the USGS National Strong-Motion Program. Bill was particularly effective at bridging the gap between seismologists and engineers, serving on numerous code-writing committees for the Structural Engineers Association of Northern California and the Building Seismic Safety Council. In recognition of his contributions and service, he was awarded the Department of the Interior’s highest honor–the Distinguished Service Award–in 2000. His technical contributions, wisdom, and humor will be missed by all who knew him. You may download a PDF file of the memorial for Bill Joyner which appeared in Seismological Research Letters 2:1, January/February 2001.